This week, Bungie finally released the new Black Armory mini-expansion for Destiny 2. While there’s no new story campaign to get into, there are a couple of new activities that players can engage in to raise their Power level. Before you can go running off to the Forge, however, first you’ll need to get a Black Armory Crate. Here’s how to find a Black Armory Crate in Destiny 2. When you boot up the game, talk to Spider at the Tangled Shore, then head to the Bazaar at the Tower to find the Armory. You’ll be given a new quest step that requires you to fix a Machine Gun Frame. There are two parts to this quest step: finding a Weapon Core in a Black Armory Crate, and gathering Ether Compound. Ether Compound is fairly easy to get in Destiny 2; all you have to do is kill Fallen enemies. The Crate is slightly trickier. To find the Black Armory crate, you need to head to either the Gulch or the Outskirts in the EDZ, like the quest step description states. Once here, you’ll be looking for a yellow-bar enemy called the Saboteur. In our game, the enemy type was a Servitor. You don’t actually have to kill the Saboteur, but do keep an eye out for a large black box near the enemy. It looks something like this. This is the Black Armory Crate you’re looking for in Destiny 2. Open it up, and you’ll get the Weapon Core required for the Machine Gun Frame quest step. Now, all you have to do is gather the Ether Compound, and you’ll be able to move on to the next step. At the moment, it’s unclear if there are set spawn points for the Black Armory Crate in Destiny 2. Again, in our game, we spawned at the Outskirts, and the box was located just off the side of the highway. 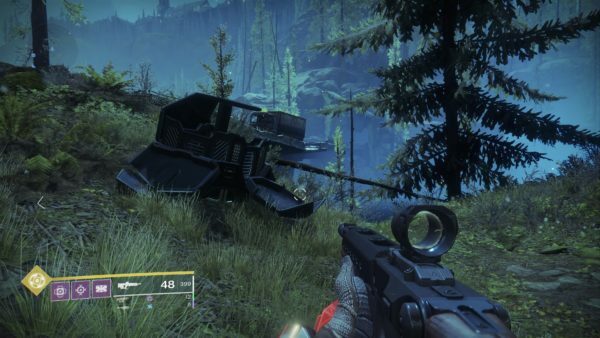 If you don’t see the Saboteur enemy, just reload the instance until it spawns. That’s all you need to know about how to find the Black Armory Crate in Destiny 2. Be sure to check our Destiny 2 guide wiki for more tips and information on the game.